New companies are fragile; one wrong move and everything can fall apart, while the race to become a global force is always on. On the other hand, while established organisations are always under pressure to maintain their stature and grow bigger, they strive to have the spirit of a start-up. The Founder's Mentality is a note of advice on how to become a 'scale insurgent' company. Zook and Allen have focused on internal factors that make a company successful for everyone - from the founder to the employees. According to the authors, the ultimate goal of all organisations is growth. But, as observed, every company witnesses a certain dry period where the fast peaking growth rate suddenly mellows down. Why does this happen? Zook and Allen answer this mystery for us - 'Growth creates complexity and that eventually slows down the corporation. It is inevitable. To regain growth, every employee needs to build a founder's mentality'. A founder's mentality comes into being by developing three kinds of behavioural changes - insurgent mission, detail orientation, and making decisions as if you're spending your own money. Every employee needs to believe that the company is not simply selling products but is at war with an industry stuck in the past or underserving customers, and they need to be the best of the lot - the company's ambition should be every employee's dream. The second trait focuses on minute details - everything needs to be perfect, without compromise, and the communication from the company's frontline to its employees needs to be crystal clear. Zook and Allen also talk about how every employee should make decisions thinking the company is his own, and that he is spending his own hard-earned money - he should be completely invested in its success. After having defined the founder's mentality, the authors move on to explain how to put the theory in use. The best part is the use of real-life stories and established names as examples. 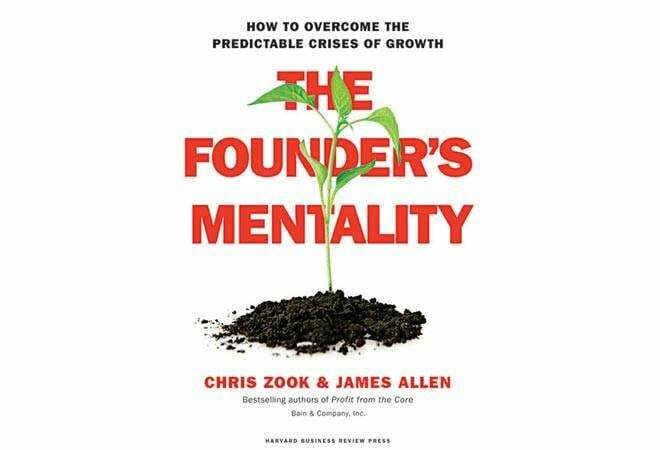 Throughout the book, Zook and Allen maintain that in order to overcome the inevitable stagnant growth crises that companies will face, they must keep or restore the founder's mentality. For each of the founders' behavioural traits mentioned in the book, the authors present a systematic usage. For example, the insurgent mission of a company often disappears when it hits overload - there are way too many people, all performing specialised roles. The best response is to engage the employees in defining, understanding and feeling connected to the company's core purpose. The ultimate goal for everyone should be the same, and employees must be engaged so that they feel as invested in the mission as the company's early employees did, as a much smaller group. Detailed orientation is very important for clear communication. Founders have a frontline obsession. But as a company grows and the team of 10 becomes 10,000, top executives become more and more distant from the frontlines. For progress and uninterrupted clear communication, companies must make special effort to embed frontline obsession in their employees that is as strong as the founder's. Empowerment is the key - if frontline employees are trusted and capable enough to solve tactical problems on the spot, they will take more responsibility and accountability. This would, in a way, also lighten the unnecessary burden on top executives. Problem-solving skills are most important for both quality and quantity of work - employees need to be fast and efficient. As a company grows, employees start becoming self-satisfied with their work and the progress rate. However, as Zook and Allen explain, leaders at best companies avoid complacency - they are never satisfied and always foresee a much brighter day. For a founder, the company can always do better, and that is the spirit they seek in their employees - they demand an owner's mindset from their employees. Companies usually maintain this striving for greater success through a culture of meritocracy and open feedback - every employee is thinking about his betterment and is more accountable for it. For example, if an employee is making a monetary deal, he should think that he is spending his own money and hence be more careful with every penny. The crux of the book is that everyone should think like a founder. The best example from the book, for me, was of the Oberoi group. The authors quote the Oberoi group founder M.S. Oberoi: "We create restaurant owners, not waiters". Owing to their corporate background, the authors have definitely put years of observations and learnings into the book. It is a must read for people who think of themselves as corporate slaves - for a new perspective to work harder and with more conviction - or young entrepreneurs working towards making their start-ups global corporations.